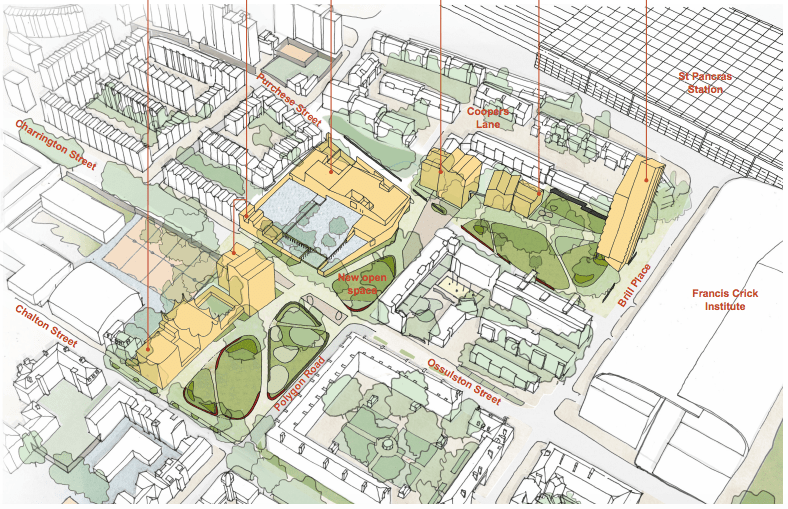 The latest CIP plans for Somers Town are at the Community Association and online here. The council wants feedback – see below for how to comment. Please submit any comments by 5 October 2015. The council has in its wisdom increased the height of the controversial block- it’s now higher at 25 storeys! Key changes are to the block – slimmer but taller, and the rest appears to be pretty much as it was – the heights are creeping up, with what’s called ‘affordable housing’ but no mention of social housing, and it’s doubtful to see how much truly not overlooked green space there will be. Visit the display at Somers Town Community Association in Ossulston St. In person – Wednesday 30 September 6pm-8pm. Visit the architectural model and leave your feedback. It’ll be in the library at 5 Pancras Square from Wednesday 23 September onwards and on Thursday 1 & Friday 2 October it will be in Coopers Lane tenants hall. Tagged CIP, Community Investment Programme, Open space, Somers Town, tower block, your feedback. Bookmark the permalink. The tower block plan is outrageous: it is totally out of keeping with low-rise Central Somers Town. Why not build a 6 storey block on the same spot but extended along that side of the park (Brill place) to cover the existing fenced-off dead space (ball-court)that is hardly ever used. Low rise not high rise ! Quite. i think building on top of the school was a preferred option at the meetings.